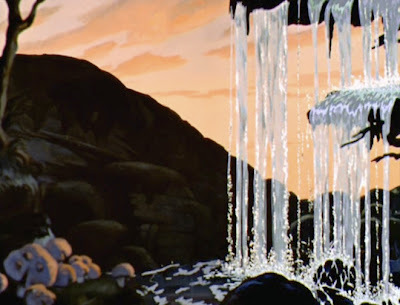 Here are three backgrounds from the SNOW WHITE sequence in which the dwarves finish working in the mine, and head home. Each background appears for just a few seconds, edited from one to the next. Each features variations on gorgeous sunset skies. 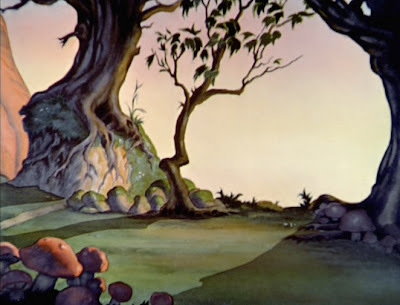 The first has a wonderful orange and green color palette, and storybook landscaping including orange mushrooms. 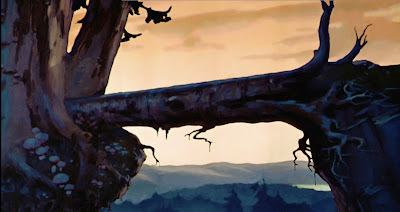 The second re-created pan background features a log bridge, not seen like this (full pan, restored) in decades. The final setup includes a gorgeous foreground waterfall via the multiplane camera.